روحانی, مهدی, شعبانیان, میثم, کرد, بهزاد. (1394). تاثیر نانو ذرات اکسید آهن اصلاح شده بر خواص مغناطیسی، حرارتی و مکانیک- دینامیکی فیلم های آمیخته نانوسلولز/ پلی وینیل الکل. مجله صنایع چوب و کاغذ ایران, 6(2), 251-263. مهدی روحانی; میثم شعبانیان; بهزاد کرد. "تاثیر نانو ذرات اکسید آهن اصلاح شده بر خواص مغناطیسی، حرارتی و مکانیک- دینامیکی فیلم های آمیخته نانوسلولز/ پلی وینیل الکل". مجله صنایع چوب و کاغذ ایران, 6, 2, 1394, 251-263. روحانی, مهدی, شعبانیان, میثم, کرد, بهزاد. (1394). 'تاثیر نانو ذرات اکسید آهن اصلاح شده بر خواص مغناطیسی، حرارتی و مکانیک- دینامیکی فیلم های آمیخته نانوسلولز/ پلی وینیل الکل', مجله صنایع چوب و کاغذ ایران, 6(2), pp. 251-263. روحانی, مهدی, شعبانیان, میثم, کرد, بهزاد. تاثیر نانو ذرات اکسید آهن اصلاح شده بر خواص مغناطیسی، حرارتی و مکانیک- دینامیکی فیلم های آمیخته نانوسلولز/ پلی وینیل الکل. 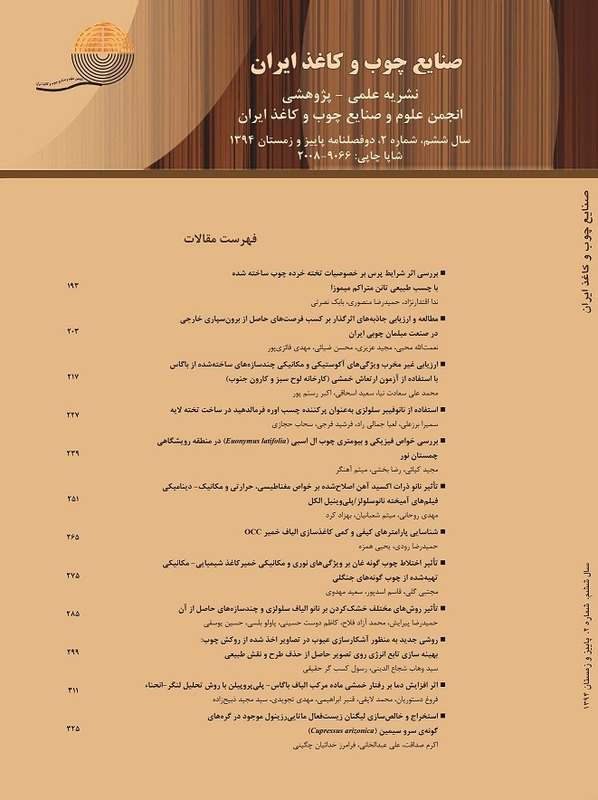 مجله صنایع چوب و کاغذ ایران, 1394; 6(2): 251-263. این پژوهش به منظور مطالعه تاثیر نانوذرات اکسیدآهن اصلاح شده(MINP) و نانوکریستال سلولز(NCC) بر روی خواص مغناطیسی، حرارتی و مکانیکی- دینامیکی نانوکامپوزیت های پلی‌وینیل‌الکلی طراحی شد. نانوذرات Fe3O4 با روش شیمیایی هم-رسوبی تهیه گردید. فیلم های نانوکامپوزیت با روش قالب گیری حلال تهیه شده و با تکنیک های مغناطیس‌سنجی نمونه ارتعاشی(VSM)، آزمون گرماسنجی‌روبشی‌تفاضلی(DSC) و آنالیز مکانیکی- ‌دینامیکی(DMA) مورد مطالعه قرار گرفت. نتایج آزمون گرماسنجی‌ روبشی‌ تفاضلی مشخص کرد که با اضافه کردن نانوذرات، دمای تبدیل شیشه بطور اندک به دماهای بالاتر افزایش یافت. با این وجود درجه تبلور و دمای ذوب کاهش نشان داد. آنالیز مکانیکی- ‌دینامیکی آشکار ساخت که در دماهای بالا بهبود خواص مکانیکی در اثر حضور نانوذرات، چشمگیر است. افزودن نانوذرات منجر به افزایش پایداری حرارتی پلی‌وینیل‌الکل و کاهش تحرک پذیری مولکول های ماده زمینه از طریق تشکیل پیوندهای هیدروژنی قوی بین اجزای نانوکامپوزیت شد. نتایج نشان داد که MINP و NCC در بهبود خواص پلی‌وینیل‌الکل اثر هم افزا دارند. یافته های آزمون VSM مشخص کرد که مغناطیس اشباع(Ms) نانوذرات اکسیدآهن بعد از اصلاح شیمیایی کاهش یافت. این مسئله به تشکیل پوشش هیدروکسی آپاتیت بر روی سطح نانوذرات اکسیدآهن نسبت داده شد. مغناطیس اشباع فیلم های PVA- MINPنسبت به فیلم های PVA-MINP- NCC بالاتر بود. این مسئله احتمالا ناشی از مقدار بیشتر ذرات مغناطیسی در فیلم های PVA- MINPاست. Krumova, M., López, D., Benavente, R., Mijangos, C. and Pereña, J. M., 2000. Effect of crosslinking on the mechanical and thermal properties of poly(vinyl alcohol). Polymer, 41 (26):9265-9272. Zhao, Ch. X., Liu, Y., Wang, D. Y., Wang, D. L. and Wang, Y. Zh., 2008. Synergistic effect of ammonium polyphosphate and layered double hydroxide on flame retardant properties of poly(vinyl alcohol). Polymer Degradation and Stability, 93:1323–1331. Mallakpour, Sh. and Madani, M., 2012. Transparent and thermally stable improved poly (vinyl alcohol)/Cloisite Na+/ZnO hybrid nanocomposite films: Fabrication, morphology and surface properties. Progress in Organic Coatings, 74: 520– 525. Peng, Zh. and Kong, L. X., 2007. A thermal degradation mechanism of polyvinyl alcohol/silica nanocomposites. Journal of Nanoscience and Nanotechnology, Polymer Degradation and Stability, 92:1061-1071. Xia, R., Heliotis, G., Campoy-Quiles, M., Stavrinou, PN., Bradley, DDC. and Vak, D., 2005. Characterization of a high-thermal-stability spiroanthracene fluorene- based blue-light-emitting polymer optical gain medium. Journal of Applied Physics, 98: 83-90. Wei, L., Hu, N. and Zhang, Y., 2010. Synthesis of polymer—mesoporous silica nanocomposites. Materials, 3:4066-4079. Tsai, TY., Li, CH., Chang, CH., Cheng, WH., Hwang, CL. and Wu, RJ., 2005. Preparation of exfoliated polyester/clay nanocomposites. Advanced Materials, 17: 1769–1773. Kong, LX., Peng, Z., Li, SD. and Bartold, PM., 2006. Nanotechnology and its role in the management of periodontal diseases. Nanotechnology and periodontics, 40: 184–196. Lu, H., Wilkie, Ch. A., Ding, M. and Song, L., 2007. Flammability performance of poly(vinyl alcohol) nanocomposites with zirconium phosphate and layered silicates. Polymer Degradation and Stability, 92: 1061-1071. Bao, Ch., Guo, Y., Songa, L. and Hu, Y., 2011. Poly(vinyl alcohol) nanocomposites based on graphene and graphite oxide: a comparative investigation of property and mechanism. Journal of Materials Chemistry, 21: 13942-13950. Guo, Zh., Zhang, D., Wei, S., Wang, Zh., Karki A. B., Li, Y., Bernazzani, P., Young, D. P., Gomes, J. A. Cocke, D. L. and Ho, Th. C., 2010. Effects of iron oxide nanoparticles on polyvinyl alcohol: interfacial layer and bulk nanocomposites thin film. J Nanopart Res, 12:2415–2426. Mallakpour, Sh. and Barati, A., 2011. Efficient preparation of hybrid nanocomposite coatings based on poly (vinyl alcohol) and silane coupling agent modified TiO2 nanoparticles. Progress in Organic Coatings, 71: 391–398. Xu, C. Ouyang, C. R. Jia, Li, Y. and Wang, X., 2009. Magnetic and optical properties of poly(vinylidene difluoride)/Fe3O4 nanocomposite prepared by coprecipitation approach. Journal of Applied Polymer Science, 11(4): 1763–1768. Paranhos, C. M., Soares, B. G., Oliveira, A. N. and Pessan, L. A., 2007. Poly (vinyl alcohol)/clay‐based nanocomposite hydrogels: swelling behavior and characterization. Macromolecular Materials and Engineering, 292: 513–681. Liu, L., Barber, A. H., Nuriel, S. and Wagne, H. D., 2005. Mechanical Properties of Functionalized Single-Walled Carbon-Nanotube/Poly (vinyl alcohol) Nanocomposites. Advanced Functional Materials, 15: 975–980. Roohani, M., Habibi, Y., Belgacem, N. M., Ebrahim, G., Karimi, A. N. and Dufresne, A., 2008. Cellulose whiskers reinforced polyvinyl alcohol copolymers nanocomposites. European Polymer Journal, 44(8):2489–2498. Lee, S. Y., Mohan, D. J., Kang, I. A., Doh, G. H., Lee, S. and Han, S. O., 2009. Nanocellulose reinforced PVA composite films: Effects of acid treatment and filler loading. Fibers and Polymers, 10(1):77-82. Cho, M. J. and Park B. D., 2011. Tensile and thermal properties of nanocellulose-reinforced poly(vinyl alcohol) nanocomposites. Journal of Industrial and Engineering Chemistry, 17:1:36-40. Can, K. Ozmen, M. and Ersoz, M., 2009. Immobilization of albumin on aminosilane modified superparamagnetic magnetite nanoparticles and its characterization. Colloids and Surfaces B: Biointerfaces,71(1): 154–159. Dufresne, A., 2000. Dynamic mechanical analysis of the interphase in bacterial polyester/cellulose whiskers natural composites. Composite Interfaces, 7 (1): 53-67. Guo, Zh., Zh, D., Zhang, D., Wei, S., Wang, Zh., Karki, A.B., Li, Y., Bernazzani, P., Young, D.P., Gomes, J.A., Cocke, D.L. and Ho, T.C., 2010. Effects of iron oxide nanoparticles on polyvinyl alcohol: interfacial layer and bulk nanocomposites thin film. Journal of Nanoparticle Research, 12:2415–2426.